How Can I Make My Car Engine Last Longer? In the age of modern vehicles, it can be tough to know what level of engine maintenance you can perform on your vehicle on your own. It seems like everything you can do for your engine on your own requires a pit or a hydraulic lift. Because of the increased need for access to professional workplaces to conduct routine maintenance, more and more people know less and less about how to care for their car engine. Or maybe you’re just a person who knows they need to keep their engine in shape, but have no idea where to begin. Not everyone has the inkling to put on a jumpsuit and conduct an oil change themselves. Most car owners agree that they want their car engine to last as long as possible, and that means getting the engine checked out periodically. But where do you start if you have no idea when or how to conduct engine maintenance in a car? How Do You Maintain a Car Engine? This can seem like an overwhelming question to some people. Where do you even start in regard to something as intricate as an engine? This process can be simplified by breaking down the questions you have about keeping your engine functioning. You should assume that if you see the engine maintenance light come on in your vehicle, you have waited too long to get your engine checked. That being said, the check engine light can alert you to random malfunctions and errors that were not preventable by preventative maintenance, so always check your engine when this light comes on. This can help keep small problems from turning in to big or potentially life threatening problems. Engine maintenance comes in two different forms. First, there is preventative upkeep. These are the things you do in between regular service visits to ensure your engine doesn’t fall apart in between visits to the mechanic. Your mechanic can also perform preventative maintenance on your car and engine to keep it from deteriorating. Next up are repairs. No matter how much preventative maintenance you perform, or the quality of the parts and labor you put into your vehicle, eventually something will break. By emphasizing preventative upkeep, we hope to reduce the amount of repairs your car will need over its lifetime. There are several preventative steps you can take without a mechanic, as well as things to look for to ensure that your vehicle gets to the auto shop in time before major issues pop up. What Regular Maintenance Does an Engine Need? Basic engine maintenance boils down to replacing dirty or old components and fluids. Parts get old and worn out. Fluids are burned off or get dirty over time. “But how do I keep my car engine running smooth?” People ask mechanics this question all the time. The following is a small engine maintenance checklist that can help you improve your car engines longevity. Check Fluid Levels: Power steering fluid, transmission fluid, and all other fluids serve a purpose in your vehicle. Ensuring you have the proper amount in your engine can keep you from having a breakdown in the future. Change Your Oil: Oil is important enough that it gets its own bullet point. Yes, other fluids in your car are important too. However, oil keeps the moving parts of your engine lubricated. If you get too low on oil, the friction in those parts will increase, and you risk throwing a rod or blowing out your engine completely. Most scenarios involving an engine with low to no oil require engine rebuilding services. 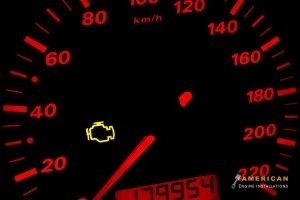 By the time the low oil pressure light comes on, it may be too late. Stay on top of your oil levels and oil change dates. This is the most important of all of these listed engine maintenance tips. Check Your Battery: Batteries make kick-start your engine. If something happens to it, your car isn’t going anywhere. Battery terminals can corrode over time. Corrosion can be cleaned off manually, as long as you’re careful. Some swear by home cleaning agents, but there are professional grade cleaning solvents available to remove battery terminal corrosion. Make sure you disconnect the car battery before attempting any kind of maintenance on your car or battery terminals. Examine Belts and Hoses: Checking all visible hoses and belts for signs of damage can help decrease your chances of random breakdowns on the road. If you notice one of the belts in your engine seems to be damaged, closed to snapping, or becoming stretched, you should get it replaced immediately. Rotting or damaged hoses can also create problems if not repaired or replaced quickly. Check Spark Plugs and Cables: A damaged spark plug cable can create a lack of power getting to your engine when you try to start it. It can idle incorrectly, your engine may not get the power it normally does, and you may see an increase in fuel consumption. Sometimes the damage is visible, like a wild animal gnawing on the cables and leaving visible marks. If there is no visible damage to the cables, that doesn’t mean there isn’t a problem. The cables could be going bad. However, it could also be the spark plugs themselves. They may need to be cleaned or replaced. Keeping an eye on these help ensure fewer problems in your engine. Check Filters: Dirty filters can lead to decreased performance in your engine. Oil filter damage can cause leaks or permanent oil damage. Dirty fuel filters decrease overall gas mileage, as well as cause damage to the fuel pump. Dirty air filters can cause your vehicle to not create the proper level of combustion during the ignition process. Clear Basic Debris: If you park your vehicle under a tree, it’s possible for leaves to get underneath the hood of your vehicle. It’s unlikely that dead leaves are going to pose a serious threat to your engine, but rotting materials can cause faster deterioration in hoses. By removing small debris more often, you also are more likely to catch larger debris. Sometimes animals can find their way into your engine compartment for warmth. If something happens, and they get stuck in your engine, it can cause both functionality issues, and a problematic smell. Pay Attention to the Check Engine Light: Probably the most important thing you can do for your engine is pay attention to the check engine light. Many people ignore this as long as their car is functioning, but waiting can cause a small problem to become a problem that can completely destroy your vehicle’s engine. If you have a small pin-hole leak, but wait to have it repaired, it could become much larger. Suddenly a small patch job becomes a complete component replacement. Engine maintenance is usually much cheaper than emergency engine repairs. You know some of the basics. You may find yourself asking now “At what mileage should I service my car?” Timelines differ for varying reasons. You may have an older car, or you may drive more than the average person. Someone who has a longer commute will definitely need to get their vehicle serviced more often. There are several benchmarks for having your car serviced. If you take your car somewhere for an oil change, most place will leave a sticker with a visible date or mileage at which you should have your oil changed again. For everything else, there is the benchmark of 12 months, or 12,000 miles, whichever comes first. Yearly maintenance is always a good idea, but if you drive more than the average, you should get your vehicle inspected more often. Also, while it does not impact the engine directly, ensuring that the rest of your vehicle is in good working order will help keep your engine running smoother for longer. Inspect your tires and suspension when you can. Anything that can cause you to have a blowout while operating your vehicle is something you should examine every once in a while. Anything that can damage your car while in motion has the potential to cause you to damage your engine through and incident or impact. If you’re in Marietta and Atlanta, GA and want to know more about or need engine maintenance, call American Engine Installations at __PHONE__ today. Posted in Uncategorized on February 4, 2019 by American Engine Installations.